• Who's Who in Who-ville (interactive map) - There are so many interesting characters that call Who-ville home that it’s hard to keep track of them all. This “Who’s Who” pop-up book uses animation to create a virtual storybook that takes us from Who-ville to Mt. Crumpit. • "You're A Mean One, Mr. Grinch" Lyric Video – Tyler, The Creator puts a modern spin on the Seussian Christmas classic. • Yellow is the New Black – Before they all make their big escape from prison in Despicable Me 3, a couple of lucky Minions get a taste of freedom as they break free with the help of one of their fellow human inmates. • Dog Days of Winter – Max braves the harsh winter weather and an uncooperative Who to bring a sick Grinch his favorite hot tea. • Santa's Little Helpers – Fan favorites – the Minions – are back for another adventure! Having been accidently dropped off at the North Pole, our Minion pals make the most of the situation by trying to become elves. • The Making of the Mini-Movies - Mini in size but not in heart, these short films are fan favorites. From the Grinch and Max to the Minions – you’ll explore the themes of each of the mini-movies through the eyes of the filmmakers who made them. • From Green to Screen - It takes a lot to bring grumpy green to your home screen. This inside look at the making of Illumination’s Dr. Seuss’s The Grinch features interviews and behind-the-scenes moments with the cast, filmmakers and artists whose hearts have all grown three sizes bringing this classic tale to life. • Illuminating THE GRINCH - Using filmmaker and cast interviews, concept art and progression reels, we take a behind-the-scenes look at how the characters evolved from initial sketches to fully realized characters. 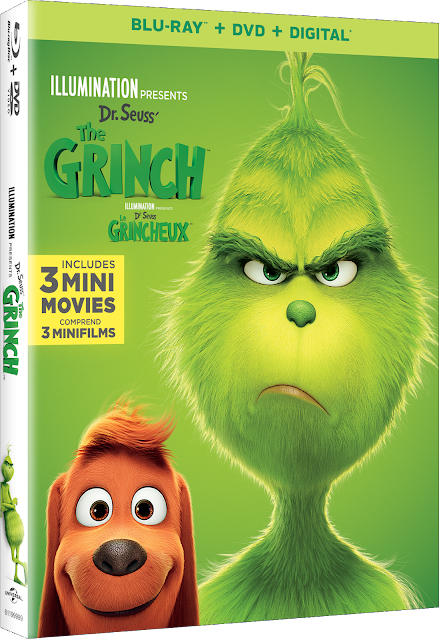 • My Earliest GRINCH Memories - The cast and filmmakers of Dr. Seuss’s The Grinch reveal their earliest memories of the grumpy green character and the enduring appeal of this Christmas curmudgeon’s journey to redemption. • Grinchy Gadgets - From his body-size blow dryer to his moving mechanical chair, from his catapult to his dog drone-rig and more… you’ll get to explore the wondrous world of Grinch’s gadgets. • "I Am The Grinch" Lyric Video - A stylized look at Tyler, The Creator’s original song created just for the film. • Songs From His Little Heart - Take a deep dive into the toe tapping beats of Dr. Seuss’s The Grinch. From score to specialty songs, you’ll hear from the film’s A-list musicians on what it took to create the music behind the movie. • X-mas Around the World - Every culture practices Christmas in a slightly different way. We’ll highlight some of the more fun permutations of the holiday around the globe. • Cindy-Lou's Yule Log - Nothing says the holidays quite like an animated fireplace blasting fake heat from your living room television. Just in time for winter, we’ll recreate Cindy-Lou’s living room on Christmas Eve for all to enjoy. • Production Babies - A celebration of the babies born to the filmmakers during the production of Illumination’s Dr. Seuss’s The Grinch. • Any Who Can Draw - Hosted by an Illumination artist and head of story Mark O'Hare, you’ll see step-by-step how to draw some of your favorite characters from this beloved holiday classic; Grinch, Max and Fred! • 4K Ultra HD is the ultimate movie watching experience. 4K Ultra HD features the combination of 4K resolution for four times sharper picture than HD, and the color brilliance of High Dynamic Range (HDR) with immersive audio delivering a multidimensional sound experience.